Ninety minutes after the September 2003 school shooting at Rocori High School, Jason McLaughlin spoke with investigators. Prosecutor attorneys played a video of that conversation as his murder trial continued in St. Cloud Monday. Both sides say the statement is a key piece in the case. St. Cloud, Minn. — At the beginning of the video, Jason McLaughlin sits alone in a tiny room. McLaughlin fidgets in his chair, looking uncomfortable, his hands are in cuffs behind his back. He mutters to himself occasionally, saying he's thirsty. Several times he puts his head down on a table. Minnesota Bureau of Criminal Apprehension Agent Ken McDonald comes into the room. After asking a deputy to take off McLaughlin's cuffs, McDonald sits down across the table from the teen. The only thing McDonald supposedly knows is that there was a shooting at Rocori High School that day. He asks Jason if he did it, and the teenager replies "Yeah,"
McLaughlin tells agent McDonald he smuggled a gun to school that morning, in a gym bag. "What was your plan?" McDonald asks. "I was going to shoot some people," McLaughlin replies. "You were going to shoot some people?" "They were teasing me all the time." McLaughlin goes on to say that Seth Bartell, a fellow freshman, had been picking on him for two or three years . During testimony, several Rocori students have said that Bartell may have teased McLaughlin occasionally, but claim it was nothing serious. McLaughlin says he wanted to hurt Seth Bartell, for making fun of his acne. "How were they teasing you?" McDonald asks. "About your zits? What was your intention?" "I just wanted to hurt them." "Did you want to kill them?" the investigator asks. "I don't know if they're dead or not to tell you the truth, but that wasn't your intention?" McLaughlin is fairly calm at this point. 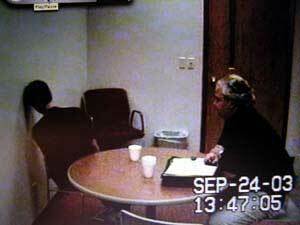 He explains to McDonald that he shot Bartell in the back in the school basement, then followed him up some stairs to a gym, and shot him a second time in the shoulder. That second bullet actually hit Seth Bartell in the head. He died two weeks later. Aaron Rollins was killed in the basement. The defense claims he was killed by a stray bullet meant for Bartell. Agent McDonald leaves the room to get more information from other investigators about what happened at Rocori, and returns to tell McLaughlin what he's found out. McLaughlin slams his fist on the table, hits his head on a nearby wall, and then breaks down sobbing. McLaughlin acts bewildered at the news. He says he's never heard of someone called Aaron Rollins. McDonald goes over the question again of what he'd planned that day. "Did you have intentions of killing anybody?" "Did you plan to kill anybody?" "You planned to hurt somebody?" The prosecution says this video shows that Jason McLaughlin knew what he was doing that day. And that since he shot Seth Bartell in the head, he meant to kill him, not just wound him. McLaughlin's attorney says the tape proves McLaughlin never meant to kill anyone, and the killing of both students was a mistake. McLaughlin's attorney says he also plans a mental health defense in the case, claiming an emerging mental illness clouded his client's judgement that day. Also on Monday, McLaughlin's father took the witness stand. David McLaughlin, who described his relationship with his son as close, is a sargent with the Stearns County Sheriff's Department. He testified he'd taken his son to several shooting ranges over the years. And he said he had 20 guns in his home, one of those guns is the one Jason McLaughlin is accused of using in the school shooting. David McLaughlin said when he found out his son was playing violent first-person shooter video games, he told Jason to get rid of them. The state is expected to rest it's case today. A verdict could come from Judge Michael Kirk in coming days. That will bring an end to the first phase of the trial. The second phase, which starts July 18th, will examine Jason McLaughlin's mental state at the time of the shooting.